Every week a handful of emails hit my inbox about a new backpack on Kickstarter or Indiegogo, complete with a flashy video and promises of revolutionizing how I carry all my toys. I’ll be the first to admit that I’ve been tempted to donate to quite a few of them. But it’s hard to be pulled away from the Lowepro camera bags I’ve owned over the years. If you’re a photographer, there’s a good chance that at some point you’ve carried a DSLR and a myriad of lenses in one of Lowepro’s packs. The company’s spent the past 45 years coming up with ways to protect and haul camera equipment. 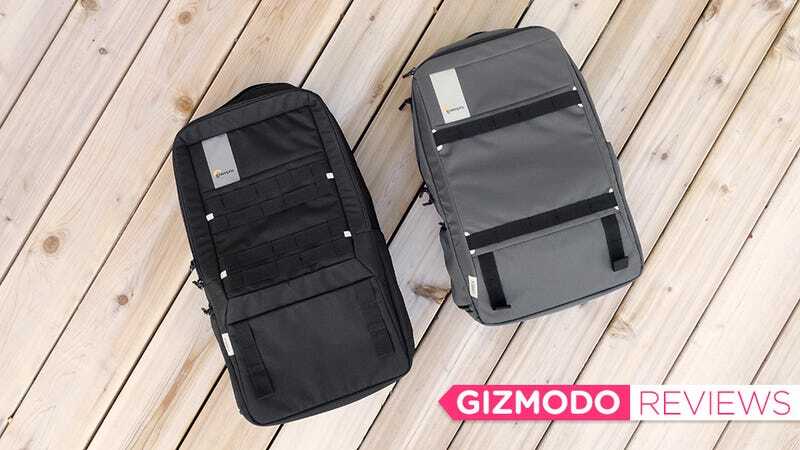 With its new Urbex bags, the company reinvents that camera-focused legacy with a line that’s focused on being the bag for all of your gadgets, and the clutter that comes with them. Lowepro's first backpack designed to carry everything but a big camera. Quick access to your gadgets without having to remove the pack. Great for commuting, but not big enough for longer trips. 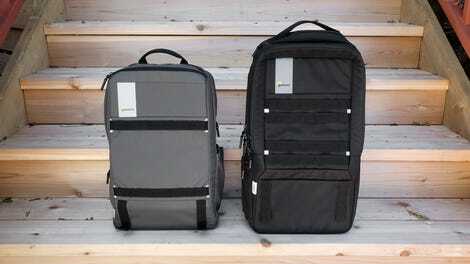 That led to Quehl designing a backpack that’s focused on hauling and organizing all of those gadgets. “I keep hoping that the next new gear will have much better battery life and reduce the number of cables I need to carry,” he said, “but it’s just more cables, adapters, back-up batteries every year.” So instead of risking going the way of the DSLR, which has rapidly seen its market shrink as it goes more niche, Lowepro is evolving its bags to carry everything else as well. And the resulting pack doesn’t look dorky. The company’s new Urbex backpack, available in 20 ($100), 24 ($130), and 28-liter ($150) sizes is not only a reflection of how photography has changed, it’s also a reflection of how much gear we can’t leave home without nowadays. The Urbex includes some clever innovations that make it easier to wrangle laptops, smartphones, tablets, gaming devices, and a rat’s nest of charging cables. As a bag aficionado who refuses to address his addiction, I’ve tried countless backpacks over the years, and what excited me most about Lowepro’s new Urbex was a feature called the GearBox, a small zippered case filled at the the bottom of the pack with pockets and elastic straps for stashing cables, memory cards, batteries, and all the small accessories that often get lost. Not only does the GearBag help keep all that stuff organized, it can also be easily accessed while still wearing the backpack using a zippered door on the side of the Urbex. You should be able to quickly yank the case out, grab a battery or a charging cable, and then safely tuck it all away again, without having to dump out the entire contents of your pack. When flying, I like to squeeze a change of clothes into my backpack in case my luggage goes missing, in addition to all of the electronic distractions I need for a flight. But the 20-liter Urbex’s slim and tall profile, which makes it ideal for a daily subway commute, but doesn’t have enough room for extra clothes with the GearBag installed. It’s a trade-off that doesn’t exist for the larger, 28-liter version of the Urbex, which features a capacious main compartment. But while that pack is great for traveling, I found it much too large and conspicuous to wear as a daily commuter. The Urbex’s other innovative feature also happens to be one of the most requested from its userbase: A phone pocket. A zipper on the backpack’s left shoulder strap reveals a pouch that unfurls so you can keep your smartphone, secured by a velcro flap, in easy reach all the time. Though it appears to come at the cost of a chest strap connecting the shoulder straps together, which is something I use quite often on other packs to help keep the weight comfortably distributed when my pack gets especially heavy. I’ll be the first to admit that the Urbex’s GearBag and Phone Pocket features do feel a bit gimmicky, but I’ve found both genuinely useful having used the backpack for a few weeks now. Given Lowepro’s been designing bags for decades, the Urbex is, unsurprisingly, a solid gear hauler with dedicated compartments for laptops, tablets, water bottles, a generously-sized glasses pocket, and a pass-through loop for securely perching the pack atop a suitcase—a feature I rarely see in backpacks. Is the Urbex a better product if you’re a professional photographer? No. There’s still a place for giant DSLRs and even giant lenses, and that place is not inside this backpack. But I like the idea of entrusting my gadgets and toys to a company that professional photographers trust hundreds of thousands of dollars of camera equipment to. It means I can finally retire all those other bags. Lowepro has been making camera bags for decades, so there’s added confidence that all of your toys will be safe inside the Urbex. The quickly-accessible GearBox saves you from having to dig through a morass of cables and hardware to find what you need. Includes a convenient expanding pocket for carrying your smartphone on its shoulder strap. The smallest 20-liter version is great for commuting, but less ideal for traveling and carrying more than just gadgets. The largest 28-liter version is great for travelling, but it makes you feel like you’re wearing an Everest-ready expedition pack. Not great for carrying a DSLR or camera lenses—the Urbex is designed for everything else.